A bruising bath brush scene from Two Lesbians Paddled by Southeastern Woodshed. A bruise (also known as a contusion or ecchymosis) is caused by blunt impact in which the capillaries are damaged, allowing blood to seep into the surrounding tissue. 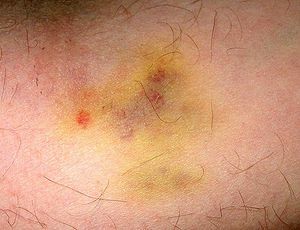 Bruises are characterized by black, blue, purple, brown or yellow hematomas in the days following; a discoloration which does not blanch when pressed upon. In spanking, bruises are typical marks caused by heavyweight implements such as paddles, (hair) brushes, straps, tawses or belts. They take many days or weeks to fade, during which time they will often change in color. Ice bags applied as soon as possible can help reduce bruises. Some people recommend the use of witchhazel or arnica to treat bruises, to help them to heal more quickly. Severe clothes brush bruising in Niece Mandy by Southeastern Woodshed. To spanking fetish enthusiasts, the appearance and coloration of bruising is a large part of its appeal. The various shades, ranging from pink to red to purple, chart the progress and severity of the punishment. In fact, the absence of bruising would indicate that the spanking was fake. As a result, it is a common practice among models posing for spanking magazines and actresses appearing in fetish films to apply rouge makeup to create convincing looking bruises and welts. Example of a handprint bruise. Illustration of hairbrush bruising by Danny M.
Sketch of Kailee by Jameslovebirch (2012). This page uses content from Wikipedia. The original article was at Bruise. The list of authors can be seen in the page history. As with Spanking Art, the text of Wikipedia is available under a copyleft license, the Creative Commons Attribution Sharealike license. This page was last edited on 22 January 2013, at 01:48.